After the successful progression of the exhibition Africa Select I in February this year (2007), the gallery presents again six different positions of African artists. 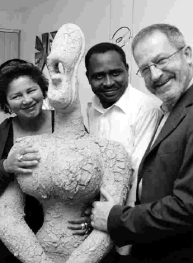 On display are selected paintings and sculptures by Osi Audu, (Nigeria / USA), Diagne Chanel, (France), Sokey Edorh (Togo), Amouzou Glikpa (Togo / Germany), EL Loko (Togo / Germany) and painter Luis Meque from Zimbabwe, who unfortunately died much too early. Diagne Chanel, Amouzou Glikpa and Joachim Melchers (ARTCO) at the opening of the exhibition.